Openfolio is a consumer investment app that allows its users to anonymously sync, share, and compare their investment portfolios. At Studio Rodrigo, I worked directly with the founder, to overhaul and redesign the version 2 of their app from the ground up. 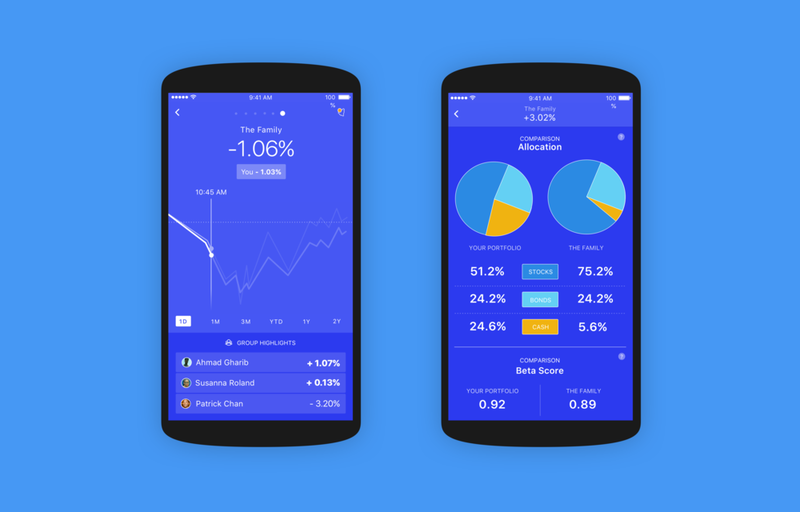 We incorporated research and data from the previous version, as well as our own knowledge, to create an app that would help both novice investors and experienced traders understand and confidently manage (or patiently ignore) their portfolios. Most trading apps and investments tools portray gains and losses in stark red and green terms, even when the losses or gains are relatively small. This can lead to disastrous results for novice or long-term investors, who might be compelled to sell when they are in the red and buy when a stock is growing quickly. We wanted to help users understand their own performance as it related to their peers, the markets, and over time. We created an interface that uses shades of neutral blue to de-emphasize the inducing behavior that red and green created. 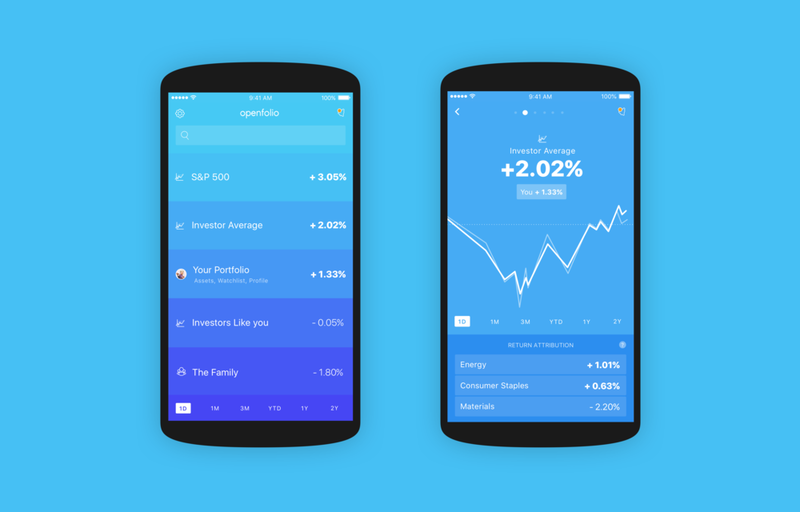 Openfolio's investor index data is the star of the app. It allows users to compare themselves to averages of real people with real portfolios not just markets and industries. We created categories that help a user find "investor indexes" that match their own goals. The ultimate goal of Openfolio is to make investors more literate. We designed comparisons that go beyond simple returns so they can dig into the data and find out why they are performing differently and adjust their holdings appropriately. We also designed a chat interface that functioned as a way to get updates about the market and a seek advice about their investment goals. 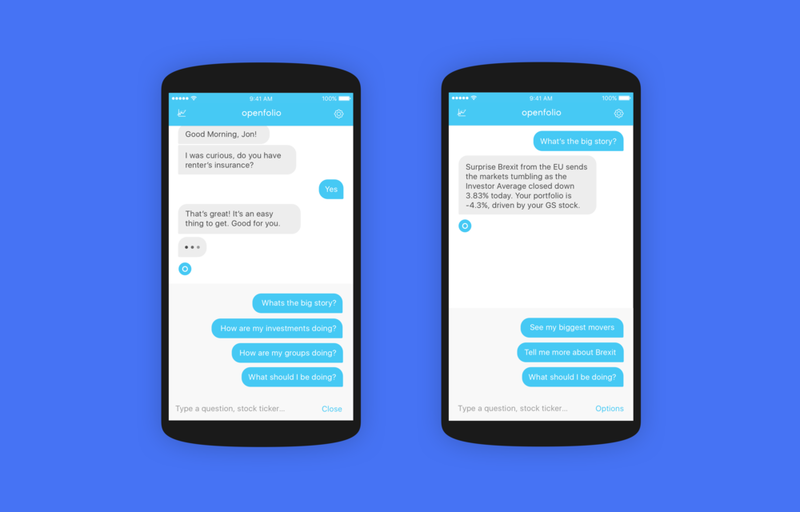 Openfolio used this interface to deliver chat-bot style, automated news alerts and simple advice. It also could hand the user off to a real person and became an acquisition tool, guiding users in search of expert advice to professional financial services partner.